Summary: After a brutal nuclear war, the United States was left decimated. A small group of survivors eventually banded together, but only after more conflict over which family would govern the new nation. The Westfalls lost. Fifty years later, peace and control are maintained by marrying the daughters of the losing side to the sons of the winning group in a yearly ritual. I've had this on my TBR list for a while and as this week I've resolved to get some of my backlog of YA titles read, I chose this as one of them. How awesome is that cover? From the summary, I thought I was getting a taut, dystopian telling of an imbeded assassin (Ivy's married into the Lattimer family thorough Bishop) but that's not really what happened. It's my own fault for having the expectation and for thinking that the sameness that seem to plague so many YA books I've read in the last few years would rear it's persistent head here. But it did. 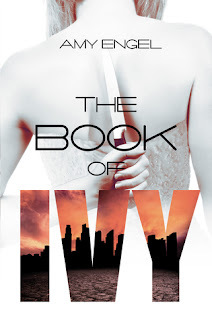 Ivy's been set to the task of murdering her mark, new husband Bishop. She's sixteen and he eighteen. In the "nation" they reside of Westfall (somewhere near what used to be the Ozarks in the world we know) they are opposite sides of the winners & losers. Ivy on the losing side & Bishop on the winning. To keep the peace, the Westfall daughters marry the Lattimer sons. Founder Westfall, Ivy's father wishes to usurp the power from president Lattimer and Ivy's assassination of Bishop is the initiating domino. I was so excited to see what unfolded. What was to come for the main of the story was fairly well telegraphed to me when in the early chapters Ivy found about 5 words to describe and further refine Bishop's eye color. Oh hell. Here we go. I knew then, there was going to be no assassination and not even a proper attempt, for you see, Ivy was falling in love. Bishop is tooth achingly perfect to the point that he's devoid of an actual personality. Because of this, I didn't like or dislike him, he registered as a null. His reason to be is for Ivy to fall in love with him and cause her family loyalty angst. He doesn't need to be a real sort of person, so I accepted his bland presence and moved along. I didn't cheer or pine for their love because he wasn't well defined as his own person so... meh on the mance. And so the main of the book is taken up with he in turn falling for her and a lot of her whinging about what she's been tasked to do for her family's shot at primacy and "blah, blah, blah" (that's a direct quote from the book, btw, on how these people got here & that takes me into my other problem with the story, the lack of world-building. I'm a science fiction fan who loves to know the "how" and "why" of whatever world the characters I'm watching move about in. There's virtually nothing to really explain in linear detail why the people of Westfall have chosen this way of life they have. There was a nuclear war, the survivors dwindled by radiation effects and killing off one another and then voila, the Lattimers beat the Westfalls and so women gave up their autonomy and concentrate on marrying, childbearing & tending (if they're lucky) & the rest of the sad unmatched women wend their days away in nursing, midwifery or whatever other jobs the men deem good enough. Miraculously, there seem to be no persons of color in this nation (based on all the people Ivy's described in the book) save one. Perhaps they're all the anonymous people she sees in passing. There apparently are no LGBT people either and no mention about what happens to them when they obviously exist in any given population. Westfall has been rolling along for three generations so I'm fairly sure there've been some instance so I wanted to know how they fare here in this place where these people are so hell bent on marrying off boys to girls. I'm just hoping they aren't the designated "tossed outside the gates" group. So. I had a few problems with the story but then something awesome happened, the final quarter of the book. Ivy's growth arc while painfully dull at times to watch was made up for in how she came out on the other side. She dragged me along through all the romance angst to finally give me something to cheer for her. I was pulling for her when she made her choice and even empathised with her sadness at her decision. She took a bad situation and made it so that all parties were left unscathed (mortally anyway) and she bore all the consequences. That certain parties were all to easily adept at throwing her out for good an all was a good direction as well. Ivy displayed loyalty when she is shown none and it was a great moment showing her true character. That last quarter basically saved the entire book for me. It was good. So good that I want to read the next book.